It’s not secret that x86 is Intel’s bread and butter, and that as of late, the company seems to be slowing their pace of innovation. This has led to calls (including on our own Gestalt IT Rundown) for Intel to diversify out of x86, and use their considerable engineering and fabrication experience on other platforms. But while Intel is clearly x86 dependent for the time being, it’s hardly the only product line they produce. To that point, Intel just announced the availability of the Intel Neural Compute Stick 2. It’s an intriguing little device. When we think of neural networks and deep learning, it’s common to think of dense data center racks packed with GPUs, or perhaps having to scale up some mighty resources in the cloud. But what about organizations that need to do inferencing on the edge? Enter the Neural Compute Stick. 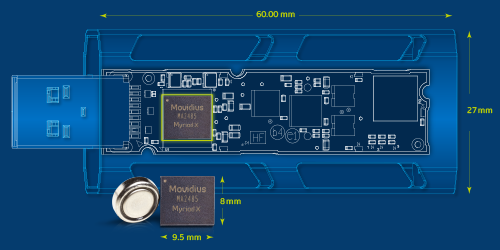 Inside what looks like a thumb drive is a 16-core Movidius Myriad vision processing unit. This isn’t a replacement for high power inferencing, but it does make it possible to do some deep learning prototyping using data directly on the edge. In terms of advancements over the original Neural Compute Stick, Intel is claiming 8x improvement on image classification, and about 6x improvement to object detection. It supports the big deep learning frameworks, TensorFlow and Caffe, and works on Ubuntu, CentOS, and Windows. For a $99 device, it is cost effective to put all over the edge, with the compatibility to deploy in almost all instances. Obviously this kind of small scale edge device doesn’t really move the needle in terms of defining who Intel is as a company. But it’s a really interesting device for its niche.